There seems to be an irresistible desire to record the Mozart operas over and over again, and obviously there is a market for them. At present Yannick Nézet-Séguin’s series for Deutsche Grammophon, masterminded by Rolando Villazón, has got about halfway through the project – I believe they do not intend to record everything. On Signum Classics, on the other hand, Ian Page has planned to record all the operas in a long-term project, and here now is the second instalment in Jérémie Rhorer’s Mozart project with Le Cercle de L’harmonie. 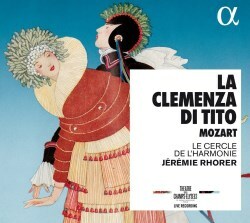 Die Entführung aus dem Serail appeared not long ago (review) and here is the next instalment, La clemenza di Tito, actually recorded a year before Die Entführung. The intention is to record the operas live at the Théâtre des Champs-Elysées in Paris. Le Cercle de L’harmonie is not a small group, 26 strings plus the usual wind instruments, and produces a substantial sound with true heft at climaxes and Rhorer keeps things going, but we must remember that Tito is a quite different work from the fairly light-hearted Entführung. Of course it is also a fairly sad story but a singspiel is supposed to sort things out in the end and there is a lot of lively Turkish-influenced music with triangles and snare-drums. Tito has also a happy end but the musical style is deeply rooted in the old opera seria tradition, and a lot of the music is fairly slow and almost oratorio-like. It is, however, immensely beautiful and sometimes I think that this is, at least partly, his greatest work. The great nuisance is the recitatives. They were not composed by Mozart himself – due to lack of time, no doubt – possibly by his pupil Süssmayr. And there is a lot of them. Luckily they are here done with a great deal of involvement and rather speedily – though not unduly rushed. That also goes for the music. Rhorer finds a sensible level that is not noticeably quicker than the average readings but with rhythmically vital playing and singing and excellent articulation one feels that the music never sags. The 24-strong chorus is excellent and the soloists can measure up against most of the competing casts. In the title role Kurt Streit, now in his mid-fifties, sounds as youthful as he did 25 years ago. He has been a Mozart specialist throughout his entire career. According to an article some years ago he had then sung Tamino in Die Zauberflöte around 150 times in 23 different productions and all the other leading roles in the most prestigious houses around the world. He is surrounded here by a quintet of utterly accomplished colleagues. Karina Gauvin is probably best known as a marvellous baroque singer, but the step to Mozart’s Vitellia isn’t very far and she dominates the first two scenes, leading up to her aria ‘Deh, se piacer mi vuol’, rivetingly sung. And in the second act she is really great in the dramatic recitativo accompagnato ‘Ecco il punto’ followed by the famous rondo ‘Non più di fiori’, the one with basset horn. The other soprano, Julie Fuchs, who sings Servilia, has less to do. She appears in recitatives and a couple of duets but comes into her own in the second act aria ‘S’altro che lacrime’, where she is really very good. Meatier roles are allotted to Kate Lindsey’s Sesto - who has her/his big moment in the aria ‘Parto, parto, ma tu ben mio’, with clarinet in the first act. Her coloratura is technically assured and gleaming – and Julie Boulianne’s Annio. The latter, Canadian like Karina Gauvin, has a darker, more contralto-like voice than Kate Lindsey and thus the two trouser roles are well contrasted. They open the second act together and then Boulianne delivers a superb ‘Torno di tito a lato’. The third Canadian in the cast is bass-baritone Robert Gleadow, and he is very good too in a role that is perhaps less spectacular than the others. Audience reactions are of course present in this live performance but don’t let that deter you from hearing this excellent production. I have, as usual, old favourite recordings of this opera too: Karl Böhm (DG) and Colin Davis (Philips/Decca), both from the 1970s, and Charles Mackerras (also DG) from 2005 (review) – all three with stellar casts. Just a couple of months ago I reviewed a set with a difference, based on performances in Vienna in 1804, where all Tito’s arias had been replaced by newly written ones by Joseph Weigl and Simon Mayr. Not necessarily a version for all tastes but an interesting experiment. Competition is hard but the present recording with Jérémie Rhorer has a lot that is in its favour – and I look forward to coming issues in this series.